Written by Janet Choi on March 2, 2017 . Meditation, like any healthy habit, takes repetition to stick. But while the folks behind Calm, a meditation and mindfulness app, knew their product’s core value was helping people to learn and build a meditation practice—initially they didn’t put too much thought into the practice part of it all. That changed when they dug into their behavior data and discovered that users who had taken pains to schedule a daily reminder in the app’s settings were much more likely to stick around. When they proactively prompted new users to set a daily reminder after completing their first meditation session, Calm saw a 3x increase in daily retention — and according to their analytics platform Amplitude, this boost impacted weekly and monthly retention as well. Calm increased the success of their product by making it easier for their users to remember to use the app for its core product value. If you make web or mobile products, you’re actually in the business of task management. You’re counting on your product to become a recurring part of your customers’ lives. In order to accomplish that, you have to motivate your users to build a new habit. Sometimes software companies forget that what they’re building isn’t just a product that people find valuable. Part of what you’re building is how people will find and experience that value. It’s easy to overlook, because it seems like enough of a challenge to build a great product that really helps users with their needs. But humans are a bit absurd. We don’t get around to fulfilling all our goals, checking off all our to-do’s, or following up on our resolutions – these are the people you’re working with! So how do you engage and retain these absurd people? Let’s look at one key to making new habits that stick. [R]emember that people are “switching” to your product whether they are coming to you from a direct competitor or not…. They have their “old way” of doing things and it’s your onboarding’s job to get them to experience the good life that your product offers. So the success of your external triggers rely on going deeper than shallow notifications and nudges. It’s not about the reminder or the product, by themselves. Nobody is intrinsically motivated to complete their profiles or come back to the product itself — they’re motivated by what they can do and get out of it. None of this works without connecting back to the user’s intentions and goals. The superficial takeaway from the Hook Model is to try to nag your customers into submission with lots of annoying triggers. Instead, your goal is to design for relevance and persuasion in order to overcome inertia and spark that intrinsic motivation. 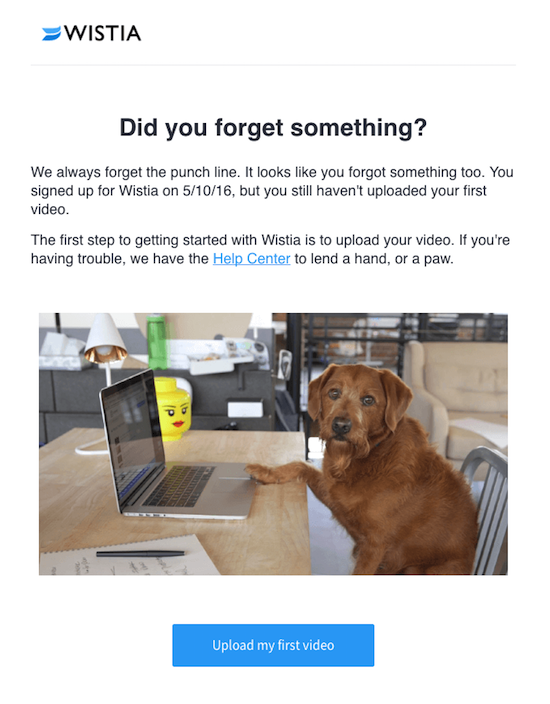 While some external email triggers can literally be reminder messages, other types of lifecycle email that nudge, notify, teach, and entertain are also types of reminders, keeping your brand or product offering top of mind. Let’s look at a few examples of emails that serve as motivational triggers. 15Five is a team management software that keep track of a company’s pulse with weekly check-ins. In each Friday check-in, you can set goals for the coming week, which helps keep you accountable and measure your progress. Every Wednesday, you get a very simple reminder about your goals. This is a great example of a trigger to build and maintain 15Five engagement. It’s reminding you of the goals that you, yourself, set (hello intrinsic motivation) — prompting you to action. Now with this mid-week check-in, I get a chance to consider my progress and course-correct instead of Friday coming around and realizing I never got around to my stated goals. 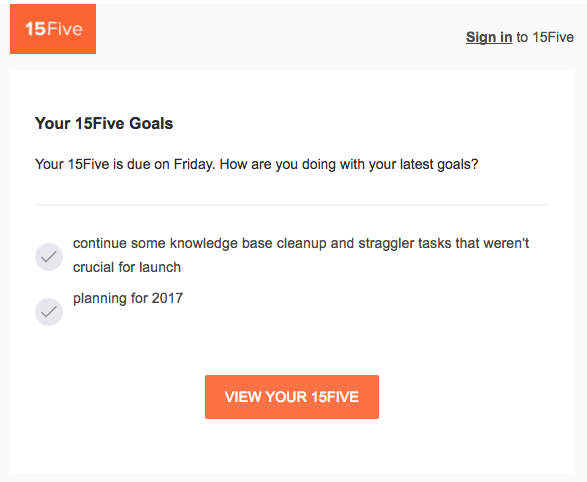 The smart move here is that the action 15Five wants you to take is user-centric: review your goals. Even if you don’t click on the “View Your 15Five” button to go into the app, you’re getting value out of the message because they’re not forcing you to log into the product to view those goals. Instead, the email reminder is acting like an extension of the product. What about building habits for businesses with physical products, like subscription boxes and services? The main actions you want your customers to take involve interacting with physical products. However, that doesn’t mean you can’t design stronger triggers to engagement. 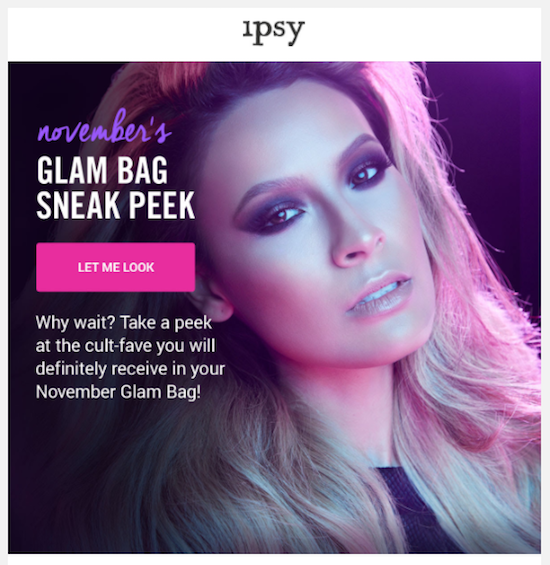 Ipsy, the monthly beauty product subscription service, sends a preview into what you can expect in your upcoming Glam Bag. The eventual action Ipsy wants its customers to take are to enjoy the products from its monthly Glam Bag. While the contents of the bag are curated by Ipsy and a bit of a surprise, Ipsy realizes that there’s pleasure in the anticipation. So they amp up the excitement with a sneak peek, which increases the customer’s gratification upon receiving the subscription and enjoyment of the whole Ipsy experience. source: Really Good Emails They’re connecting back to the user’s goal—send an effective newsletter—and providing a timely path back to finish that task. Smart touches to spark the user’s internal motivation here include providing quick metrics for the previous issue sent and a tip on social sharing for making the next issue successful. 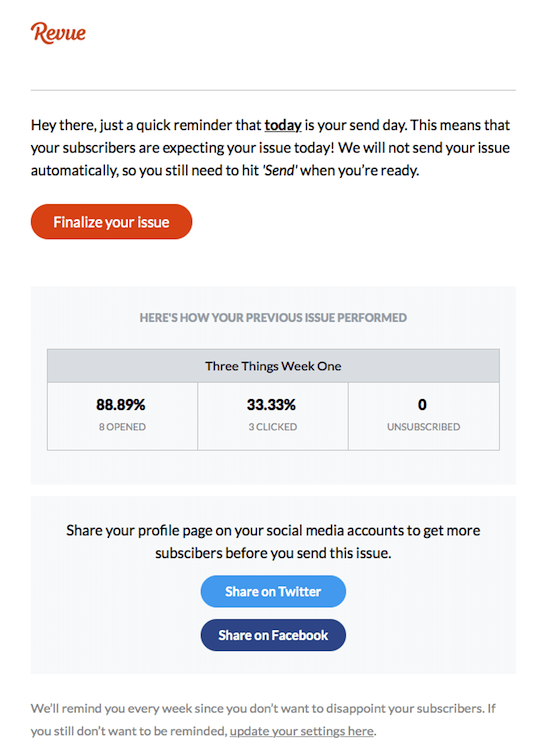 The result of sending effective external triggers back to your product? A business’s dream scenario: people actually want your emails. Duolingo uses a very similar approach to Calm, as both meditation and learning a language take practice, practice, practice. 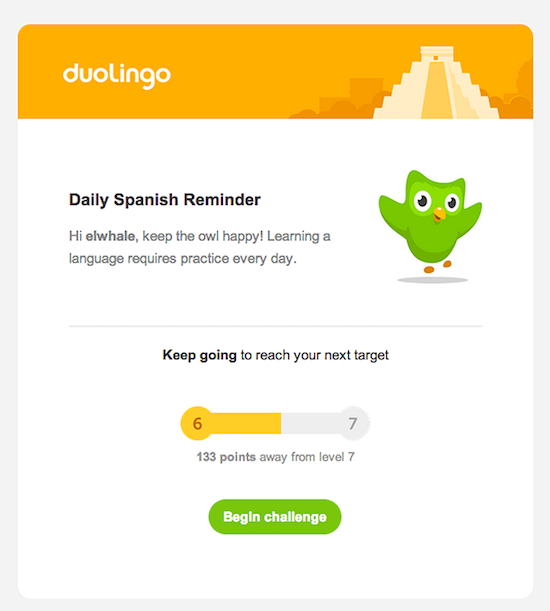 Duolingo’s daily reminder emails provide a quick nudge to keep you on track, and these reminders are a value-add feature that users can choose to set up. “Emails and notifications have been extremely effective in bringing people back,” declares Gina Gotthilf, Duolingo’s VP of Growth and Marketing. The proof isn’t just in the retention rates. Duolingo users actually find these reminder emails valuable. People actually expect them to arrive in their inbox as part of their Duolingo user experience, such that they miss them when they don’t. 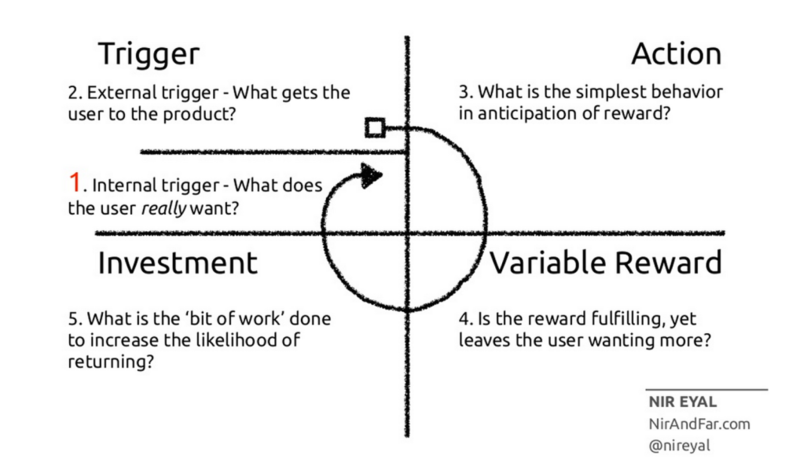 The success of your product relies on the success of your behavioral design. Guidance to value and benefit and paving the way to repeat meaningful engagement will motivate users to interact with your product, again and again. Draw on the perspective of the user, escape the insularity of company-centric interactions, and realize there’s a consequential world outside the pixels of your product. It’s your turn! What software products have become a routine part of your lives? Did they have effective triggers? Share with us in the comments!